Tornado (Breuer) Floor Machines Replacement Scrub Brushes, Pads, Pad Drivers, Disc Drivers and Clutch Plates. Note: We currently do not provide any other equipment parts for this manufacturers line at this time other then the replacement pad driver and scrub brushes. 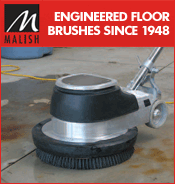 If you cannot find the pad driver or brush replacement you are looking for, please call us toll FREE 1-888-226-2724 and a sales representative will happily assist you. Sugg. PAD-LOK & Pad Holder Block Dia. NOTE: Pad Drivers requiring the 4103MB plate are to include NP-SP spacer and no riser.